Tower 3, located south of Dewey Beach in Delaware Seashore State Park, took on a cobalt-drenched tone during a lighting ceremony on Monday, Feb. 12. This spring, we finished rehabbing our mess hall. Our next project is Barrack T603, next to the mess hall. We removed all doors and windows, restored the original window openings and are refitting this building. 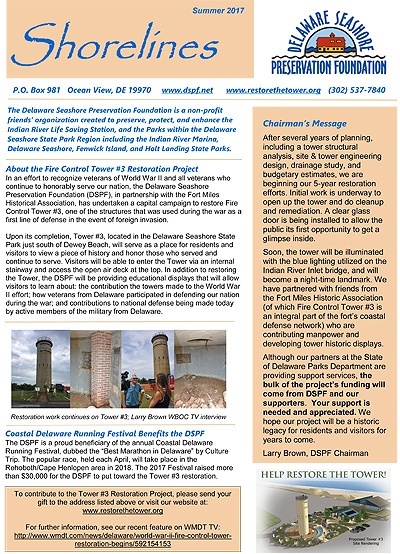 In an effort to recognize veterans of World War II and all veterans who continue to honorably serve our nation, the Delaware Seashore Preservation Foundation (DSPF), in partnership with the Fort Miles Historical Association, has undertaken a capital campaign to restore Fire Control Tower #3, one of the structures that was used during the war as a first line of defense in the event of foreign invasion. Just south of Dewey Beach, Tower 3 is getting revamped. The tower will be completely sealed off from the elements, get a new staircase, a new Plexiglas door and some entertainment areas around it. The 3rd Annual Coastal Delaware Running Festival was a full-out success. The Focus Multisport event hosted more than 3500 runners, thousands of fans and dozens of volunteers. 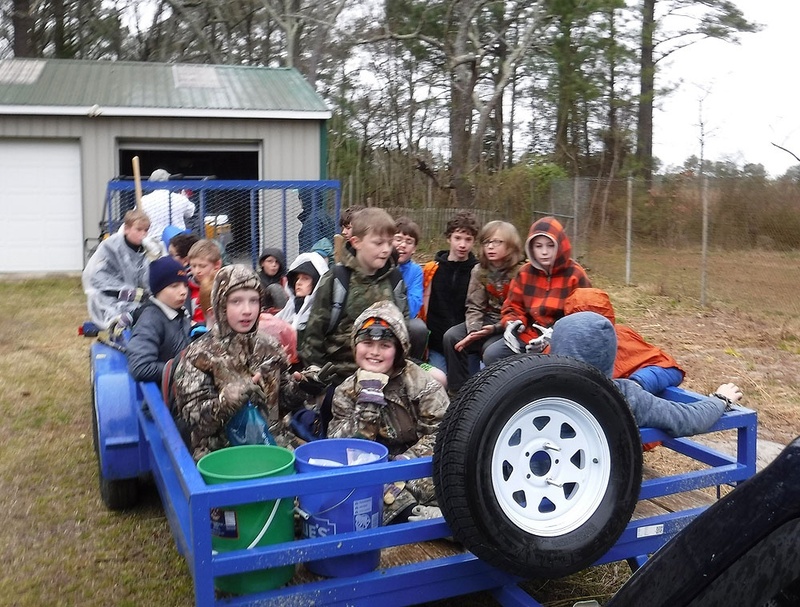 34 scouts plus leaders from Ocean View Scout Troop 281 gathered on March 18th along with a group of Friends of Holts Landing State Park for their annual Spring Campout and Community Service days. 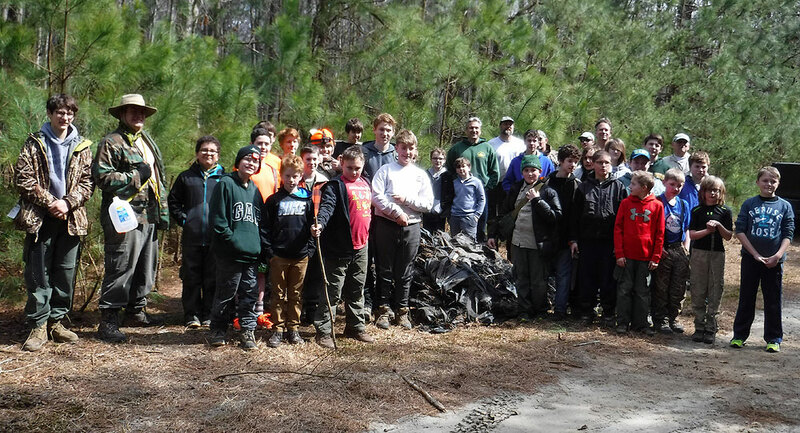 The scouts took on a effort to remove a two foot high silt fence which ran 600 feet sometimes burried up to within 2 inches of the height. The silt fence, consisting of stakes every 10 feet and black plastic silt fabric, is the remainder of an access road that was used through the park for access to the Ellis Point Development Project back in 2002. The silt fence was restricting wild life passage through the park. 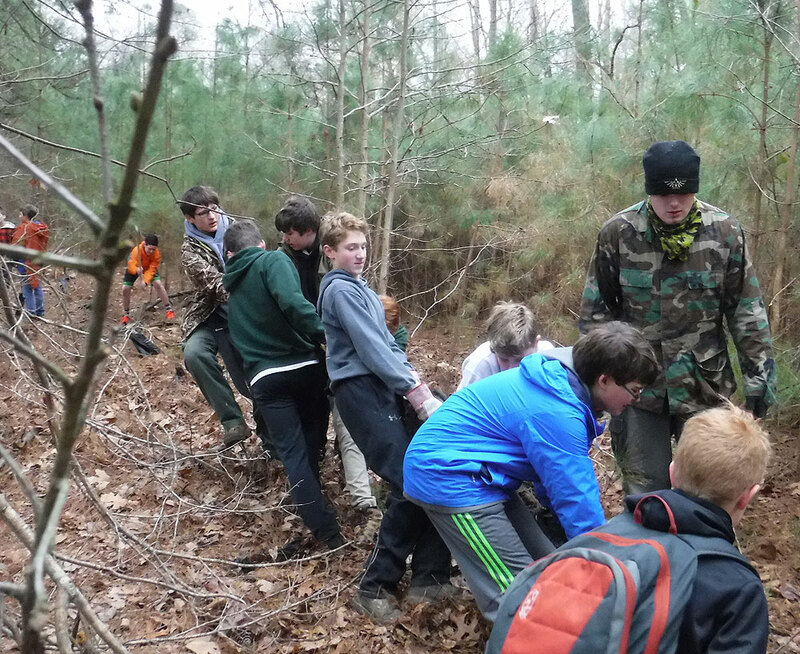 Contact Scout Master, John Doud , or Trail Boss, Laf Erickson at 302-381-3695, for further information. Photo Credit: Chuck Snyder/Special to the News Journal - When Ernie Felici looks at the rebar-enforced concrete towers that dot Coastal Highway between Dewey Beach and Fenwick Island, he sees an opportunity. Two Groups Pledge to "Save The Tower"
DEWEY BEACH, Del. - A silent reminder of World War Two, eleven concrete towers line Delaware's coast. The towers were put in place so soldiers inside could watch for Nazi boats offshore. But according to Dr. Gary Wray with the Ft. Miles Historical Association, most people don't know that. We had our largest turnout in our two years - 150+ on 7/19/16! Event will included our featured band of the summer - Charlie Papparella, Charles Lynch (steel guiltar), and John Perdu. Food (hamburgers, hot dogs, chips and sodas) by Boy Scout Troop #281 of Ocean View. 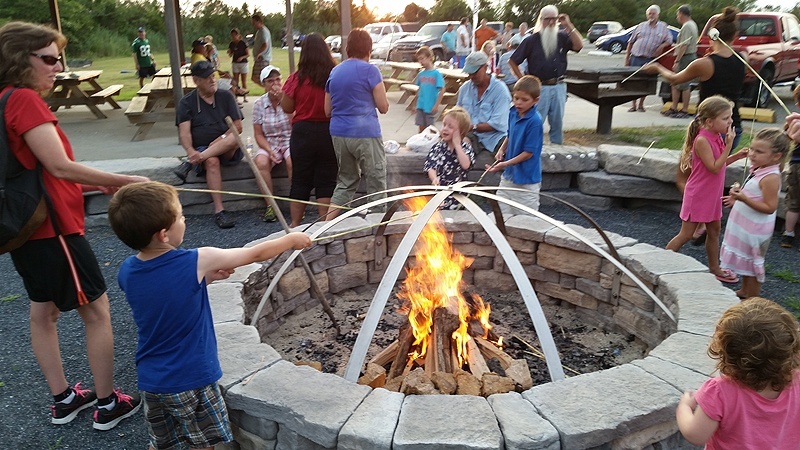 We will also have seined with hands on fish identification for kids; yard games for adults (horse shoes, corn hole and ladder golf); stargazing by a naturalist and a bonfire with a marshmallow roast. Thanks to all the Friends of Holts who participated and did a magnificent job this summer! LEWES, Del. (WBFF TV Fox 45 Baltimore) -- A pair of nonprofits is teaming up to preserve towers along the Delaware coast that were designed to protect against enemy invasions during World War II. The Delaware Seashore Preservation Foundation is a non-profit friends’ organization created to preserve, protect, and enhance the Indian River Life Saving Station, and the Parks within the Delaware Seashore State Park Region including the Indian River Marina, Delaware Seashore, Fenwick Island, and Holt Landing State Parks. The Friends of Holts Landing State Park's Laf Erickson won the 2016 DNREC Volunteer of the Year Award (for Conservation) and was presented his award by Governor Jack Markell at the Delaware State Fair on July 28th. His work as "trail boss," clearing and widening trails, helping to establish new trail signage , and installing benches has greatly improved the Sea Hawk Trail at Holts Landing State Park. L&#257;f also put in a lot of time and physical effort clearing brush from the new “kayak beach” at Holts so visitors can get a glimpse of the Indian River bay as they drive into the park. Along the Delaware coast stands a series of watchtowers that helped protect the United States during World War II. They were used to look for enemy ships and, if any had been spotted, the crews within the towers would have alerted the Army at Fort Miles to defend the shore. DSPF Open House A Success! The Delaware Seashore Preservation Foundation hosted its Annual Membership Meeting & Open House on October 31, from 1:00 – 3:00 PM at the Indian River Life Saving Station Museum. Presentations from the Delaware Seashore State Parks’ Staff and DELDOT’s new Indian River Bridge team highlighted the event, in addition to the free tours of the museum. An array of treats & beverages donated by the Gift Shop staff at the Indian River Life Saving Station Museum, G&E Hockers & the Donut Connection were available for all guests to enjoy. 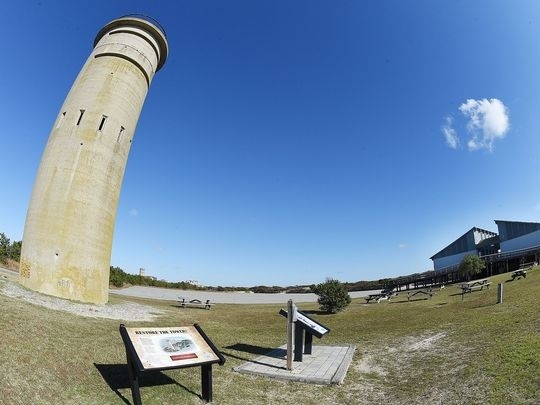 The DSPF is embarking on a project to restore the World War II observation towers within the Delaware Seashore State Park beginning with Tower #3 just south of Dewey Beach along Route One. A number of towers were built along the Delaware coastline during World War II. The towers were used as artillery spotting locations. Our military was posted in each of the towers in order to spot enemy ships sailing off our coast. The folks from the Delaware Seashore Preservation Foundation served up the hamburgers and hot-dogs with all the fixings on both days to over 100 volunteers. Groups who worked on the project are Department of Corrections, Latreia and Wartburg College, National Civilian Community Corps, University of Delaware sent volunteers from the Marine Science Center, AmeriCorps State Parks Partnership, and some sixteen park staff members gave of their time on Saturday and Sunday. It all began, Gary Wray says, with members of a couple coastal Sussex County organizations tossing around ideas about how to promote understanding of World War II. Folks in the Fort Miles Historical Association, of which he is president, and their counterparts in the Delaware Seashore Preservation Foundation talked of creating a memorial to that conflict’s veterans. 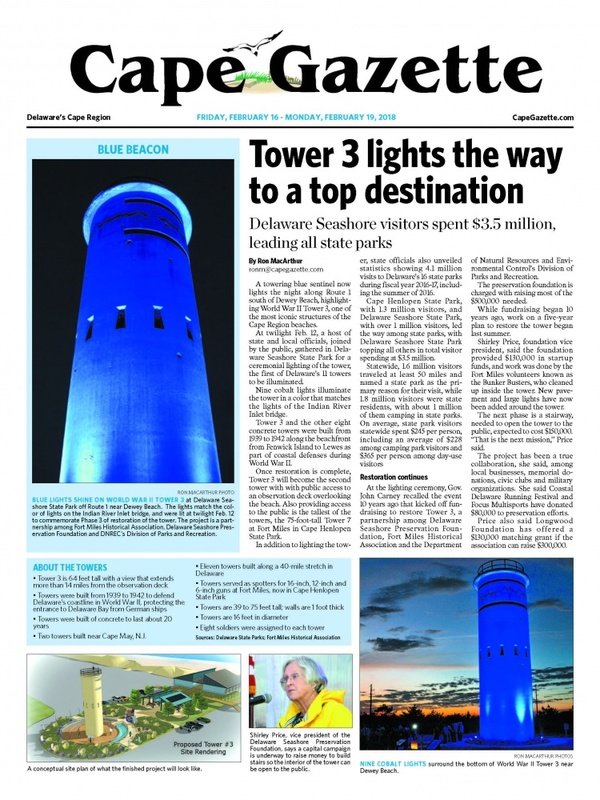 Soon, visitors to the Delaware shore and locals who travel Route 1 will no longer have to wonder from afar about the famous towers that stand along the coastline — at least, not if the Delaware Seashore Preservation Foundation (DSPF) and Fort Miles Historical Association (FMHA) have their way. The two groups announced on Wednesday their plans to restore Fire Control Tower No. 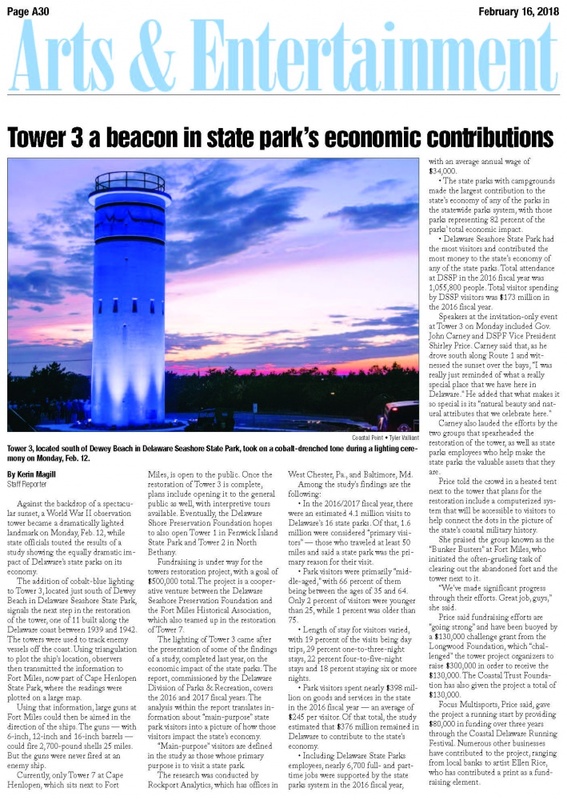 3, the southernmost tower of two located just south of Dewey Beach, in Delaware Seashore State Park. Their project, with a fundraising goal of $500,000, aims to restore Tower No. 3 to its World War II condition, open it to the general public and create a related database listing World War II veterans and donors to the project. "It's a milestone for this organization," said Ernie Felici, chairman of the DSPF. For more than 65 years 11 silent sentinels have guarded the coast. Most people are not aware of the unique history surrounding the fire-control towers assigned to Fort Miles; many are under the mistaken impression they were gun emplacements. 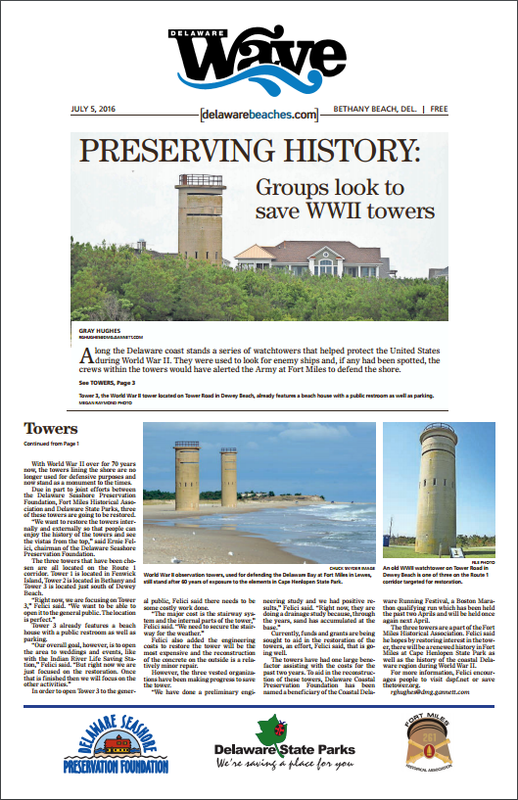 Two volunteer organizations are joining forces to open a tower in Dewey Beach in an effort to educate the public about the critical role they played during World War II. The tower will be restored to its World War II condition and be open for tours. In addition, it will serve as a location for a World War II memorial to store a database listing World War II veterans as part of an interactive display. 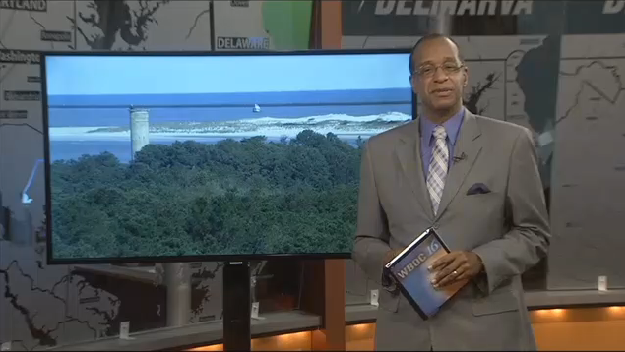 The only tower now open to the public is the 75-foot tower in Cape Henlopen State Park. Two resort-area preservation groups have joined forces to raise money for restoration of one of two World War II fire control towers just south of Dewey Beach, which they want to open to the public. 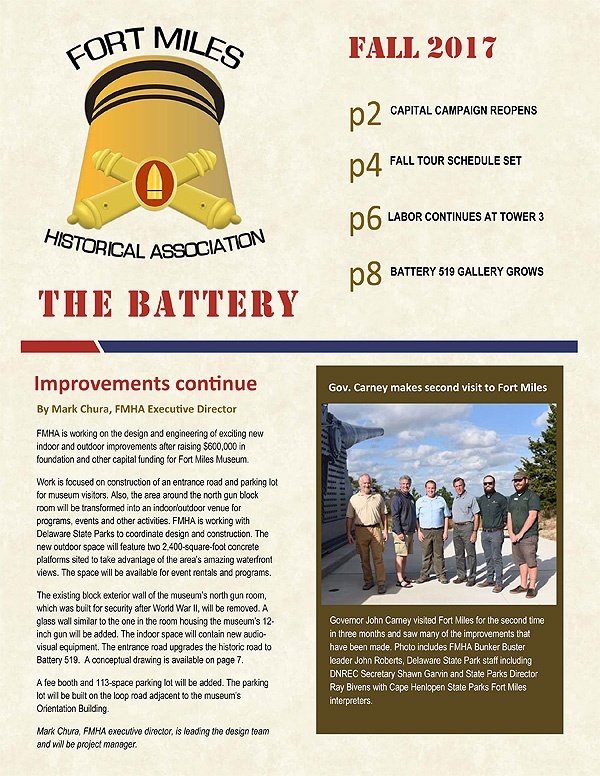 The view from 64 feet above sea level should be spectacular because from the top, people can see 14 1/2 miles east over the Atlantic Ocean, said Gary Wray, president of the Fort Miles Historical Association, one of the groups involved in the project. To the west is Rehoboth Bay. Wray's group has joined the Delaware Seashore Preservation Foundation to raise money and begin tower restoration. What Are Those Towers Along The Coast? Perhaps the most intriguing landmarks on the southern Delaware coast are the World War II observation towers. The cylindrical concrete towers were erected by the Army during World War II to watch for Nazi ships and submarines. Eleven towers dot the coast, stretching from Fenwick Island northward to Cape Henlopen. Currently, only one tower is open to the public. Located at Cape Henlopen, the tower offers spectacular views of the coast. 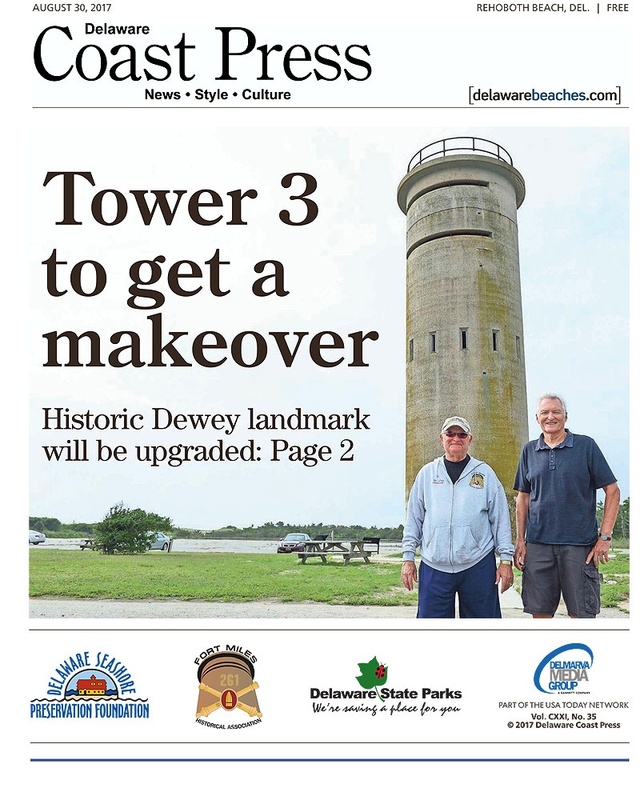 Through a partnership between the Delaware Seashore Preservation Foundation and The Fort Miles Historical Association, efforts are currently underway to restore Tower #3, located within the Delaware Seashore State Park on Route 1, just south of Dewey Beach. Once Tower #3 is restored it will be open to public and interpretive tours will be given.